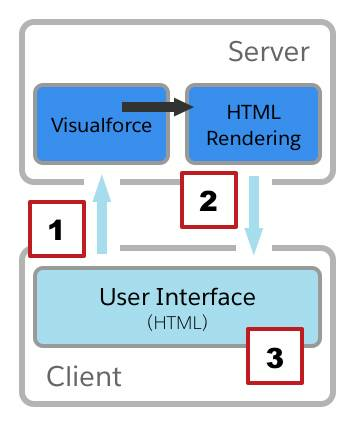 Describe the difference between a Visualforce page and an Aura component bundle, and how each is represented in resources locally and on Salesforce. Describe basic differences in the Visualforce and Aura component request lifecycle, and where component code runs. In this module, we look at Visualforce concepts and features, and then describe the closest translation into Aura components. 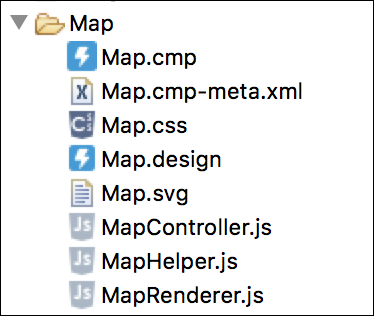 Not everything maps cleanly across. Visualforce and Aura have fundamental differences in architecture, and different requirements for how you use them to build apps. We’ll explain as many of those differences as we can, using the individual features as our signposts. Note that we’re not explaining how to use Aura components features in detail here. (That’s the Aura Components Basics module.) Instead, we’re focused on making essential differences clear, so that you can avoid turning things that sound the same into chutes you spend time sliding down. Before we tackle some of the abstract concepts, let’s look at something that’s fairly concrete: how an individual page or component is stored on Salesforce. The first is the code for the page, and the second is the page metadata (API version, mobile settings, and so on). Although your page might have dependencies on other artifacts, like an Apex controller or extension, static resources, and so on, they are separate from the page. Your page references them, but doesn’t include them. We’ll talk about the most important resources in the component bundle throughout the rest of this module. 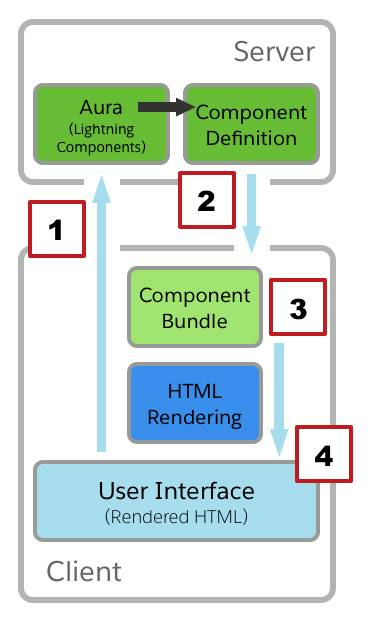 For the remainder, see the details in Component Bundles and elsewhere in the Lightning Aura Components Developer Guide . It’s easy to create and switch between resources using the Force.com IDE, which has a row of tabs at the bottom of each component’s window dedicated to exactly that. To create an Aura component, choose File | New | Lightning Bundle from the Lightning Platform options, and then choose Lightning Component for the type. 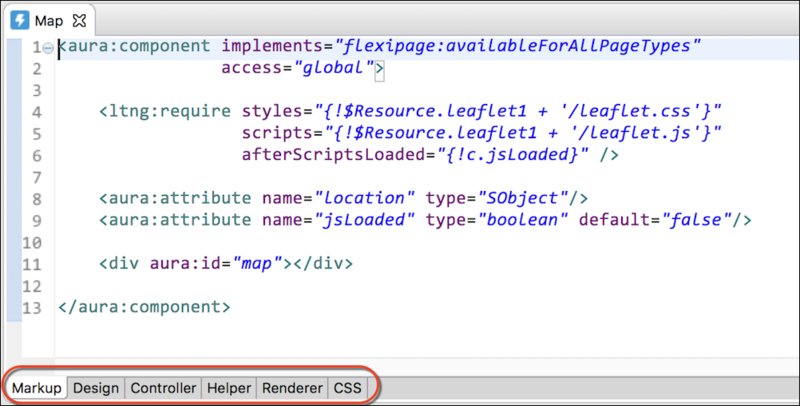 Once the main component is created, the Force.com IDE adds additional resources to the bundle as you click the tabs below the component. This is one of the two “obvious” biggies. Except, actually, what’s obvious about it? Let’s be clear about what this means, and then make sure some of the implications are clear, too. This major architectural difference has major consequences. For example, your component can interact with a user without requiring a new server request, but if your component needs to save or load new data, that does require a server request. We cover additional aspects of this divide in upcoming topics, but you need to keep the client-vs-server-side thing clear in your head when thinking about how the frameworks behave.